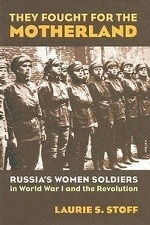 Аннотация к книге "They Fought for the Motherland"
Women have participated in war throughout history, but their experience in Russia during the First World War was truly exceptional. Between the war`s beginning and the October Revolution of 1917, approximately 6,000 women answered their country`s call. These courageous women became media stars throughout Europe and America, but were brushed aside by Soviet chroniclers and until now have been largely neglected by history. Laurie Stoff draws on deep archival research into previously unplumbed material, including many first-person accounts, to examine the roots, motivations, and legacy of these women. She reveals that Russia was the only nation in World War I that systematically employed women in the military, marking the first time that a government run by men had organized women for combat. And although they were originally envisioned as propaganda - promoting patriotism and citizenship to inspire the thousands of males who had been deserting or refusing to fight - Russian women also proved themselves more than capable in combat. Describing the formation, provisioning, and training of the units, Stoff sheds light on their social and educational backgrounds, while recounting a number of amazing individual stories. She tells how Maria Bochkareva, commander of the First Russian Women`s Battalion of Death, and her unit met its baptism of fire in combat and how Bochkareva later traveled to the and met President Wilson. We also meet Maria Bocharnikova, who served with the First Petrograd Women`s Battalion that defended the Winter Palace during the Bolshevik Revolution. Stoff also chronicles the exploits of the Second Moscow Women`s Battalion of Death, Third Kuban Women`s Shock Battalion, and the First Women`s Naval Detachment. Stoff`s remarkable account rescues from oblivion an important but still little-known aspect of Russia`s experience in World War I. It also provides new insights into gender roles during a pivotal period of Russia`s development and resonates with the current debates over the role of women in warfare.